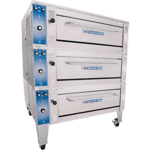 CKitchen.com offers a line of commercial deck type electric ovens from commercial kitchen equipment & cooking equipment merchandisers Doyon and Garland. Doyon offers a line of baking equipment with Stone single, double, triple or four bake decks. Units are electric with digital electronic control boards and a self contained steam injection with an oven top and stainless steel base. Garland offers a line of floor model ranges varying from pizza, bake, or roast ovens. All models are electric with the option of single, double or triple decks. Choose a Doyon or Garland deck type electric oven today and enjoy products that provide durability and acceptable performance. 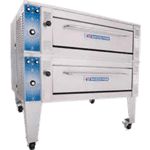 For professional assistance from certified food service equipment consultants, please contact CKitchen.com at anytime and our sales team will help you choose the right commercial ovens or other restaurant equipment.